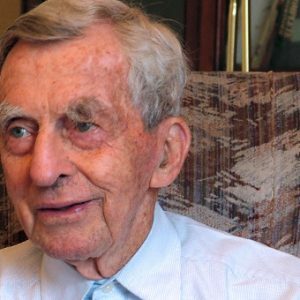 Fr Joseph Mallin SJ, the last surviving child of a leader of the 1916 Rising, died in Hong Kong on Easter Sunday. Fr Joe, aged 104, was also the oldest Irish Jesuit missionary priest. He was aged two-and-a-half when his father, Commandant Michael Mallin, was executed in May 1916 for his part in the Rising. Michael Mallin was Chief-of-Staff of the Irish Citizen Army and also head of the St Stephen’s Green Garrison, where Captain Kit Poole and Countess Constance Markievicz were his second- and third-in-command. He had joined the Citizen Army and the Irish Republican Brotherhood after he had co-founded the Socialist Party of Ireland with Francis Sheehy-Skeffington in 1904. A silk worker by profession, he had negotiated on behalf of strikers during the 1913 Lockout. Before being apprenticed as a silk worker, Mallin had served in the 21st Royal Scots Fusiliers and had served in India. In the British Army, he never rose above the rank of drummer, it is said, because he refused to donate to a fund honouring Queen Victoria’s Jubilee on the grounds that she had taken an oath to defend Protestantism. Fr Joe entered the Jesuit novitiate in 1932, the same year as the Eucharistic Congress, in which he was an active participant. Following his ordination, he was sent on the missions to Canton (Guangzhou) in China in 1948, but as Mao Tse Tsung’s Communist Red Army advanced on the city, he and other missionaries had to move to Hong Kong, where he led a very varied ministry that included times spent as mission bursar, director of a social centre, secondary school teacher, headmaster of a primary school and principal of Ricci College, a kindergarten in Macau, which was a Portuguese colony until 1999. He had a love of music and would play his father’s flute, which Cmdt Mallin had played in Liberty Hall as a member of the Workers’ Orchestra on the eve of the 1916 Rising. The flute and his father’s watch are now in the care of the National Museum of Ireland. Coming up to Fr Joe’s 100th birthday, he was asked if he regretted anything about leaving Ireland 65 years earlier. He replied that he would have liked to have spent some more time working as a priest in his home country and that he “missed the rain”. Two years ago, Fr Joe headed a campaign by the Mallin family to have papers relating to his father’s court-martial proceedings released, as promised long ago by the British government, in order to clear a slur about the commandant’s reputation. It was reported that Michael Mallin had denied that he held a commission in the Citizen Army and that he was acting under the orders of Countess Markievicz, that is, that Michael Mallin was trying to dishonestly evade responsibility for his actions – that he was a coward. In defence of the commandant, Fr Joe produced an 18-page document, ‘To the Memory of my Father’, which systematically rebuts the assertions of Brigadier General Ernest Maconchy, the president of the court martial. Launched in Kilmainham Gaol last year, the document, which makes reference to the testimony of several independent witnesses, including the British army officer who accepted Cmdt Mallin’s surrender, it is a remarkable achievement for someone aged more than 100 years old. The 1916 leader would have been so very proud of his son, Fr Joe, his little man.